Road and motorist laws regarding crosswalks, sidewalks, and right-of-ways are set in place to protect pedestrians. Pedestrians are people who are on foot or using a form of skates, roller skates, skateboards, etc. to get around. A pedestrian can also be a person with a disability who uses a wheelchair, tricycle, or quadricycle as transportation. Pedestrian safety is a significant concern. In cars, we are more protected during a collision, but a pedestrian has almost no protection in the event of an accident. As a pedestrian or driver, you can ensure pedestrian safety by being cautious and aware. You can find some simple tips and advice on pedestrian right-of-way rules here. When you get on the road, whether you are a pedestrian or driver, you should always encourage respect. Respecting and sharing the road might be what keeps you from getting into a collision. Maintaining a sense of community on the road is good. However, accidents still happen, even when we practice safety. At Raynes Erickson, we understand the complexities of traffic laws. 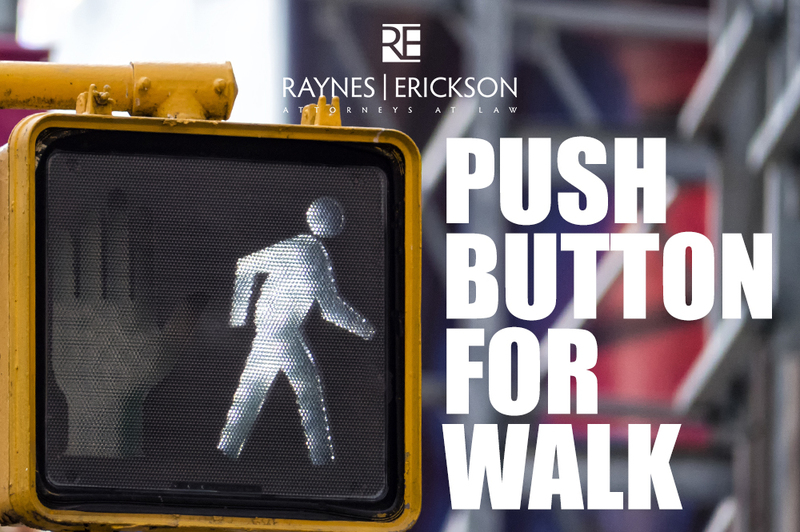 If you have been injured in a pedestrian accident, give us a call. We can help you explore your legal options and the next steps to take. The statue of limitation could already be running, so call us today!